Some thoughts on making use of our hidden histories (& herstories) to get more people involved not just in local democracy but on the futures of where we live. Cambridge and Cambridgeshire being my case study. For those of you following my Lost Cambridge project, one of the things that I’m looking at is how to make everything I do ‘Me-proof’ on the grounds that the weakest link in all of this going forward is me. For a variety of reasons which I won’t go into here. My point is that my discoveries over the past few months show that however we as a city choose to follow this up, it’s going to take far more than one man and his dragon fairy to actually do it. I also don’t want some poor soul in 100 years time to stumble across all of this work and ask why no one did follow it up assuming I get run over by a bus or something. A question we often asked in the civil service when assessing project risk was what would happen if a key individual was run over by a bus: how would the project continue? This is actually a weakness of many ministerial initiatives – as soon as the minister is sacked, transferred or promoted, the project dies a very quick death as their replacement looks to stamp their mark of authority on their new teams. My time horizon in all of this is about 15 years – i.e. between now and the centenary of Florence Ada Keynes’ mayoralty. Florence Ada Keynes shortly after her wedding to John Neville Keynes (parents of the Economist John Maynard Keynes) in Dissenting Forbears by Neville Brown. Exactly – yet through it, it allows a program to grow as big as the city and the people want it to be, rather than having a very tight deadline to complete an unbelievably large and varied projects by. It also means there is enough time for consistent branding to be developed, and something that projects developed by others can hook onto. Essentially the time allows for a significant amount of strategic planning – one where we can have a ‘year zero’ where we do that large information scoping and data collection exercise just to get a feel for what is out there. Because what I’ve found in the course of less than a year is that our civic history in Cambridge is far, far greater, more exciting and more interesting than many of us had realised. The reason why this matters is because a number of the colleges hold archives of letters and papers of people who were very important and influential in the shaping of our town and city. Some of the colleges are not actually aware they hold those papers outside of their archivist community. Others will have forgotten the part some of their former members played in how Cambridge the town grew, and more importantly how we improved the provision of social and public services as a result of the intervention of civic-minded individuals. The point being is that those individuals, as well as being part of the colleges’ histories are also part of the town’s history too. Once you’ve established that shared connection, then you can start talking about how to commemorate it. For example Florence Ada Keynes above was one of the earliest students at Newnham College – as were more than a few of the most prominent women social activists in the late 19th/early-mid 20th centuries. To pick two more individuals, Sir Horace Darwin, Fellow of Trinity College, founded the Cambridge Scientific Instrument Company (which became a huge local employer, and whose offices on Chesterton Lane now house The Job Centre), and Sedley Taylor, (also at Trinity College) who paid for the first municipal dental clinic in Cambridge, and for free checks for all children at council run schools in 1907/08. Remember this was the time before the welfare state and most families couldn’t afford a dentist. Sedley Taylor Road, Cambridge? Yep, named after him. 1918 – Representation of the People Act 1918 giving some women the vote for the first time, and also removed the property qualification on men who otherwise were still barred from voting. 1929 – first elections that women could vote on equal basis with men following the Representation of the People (Equal Franchise) Act. Thus the UK did not get Universal Suffrage until that Act was passed. 1933 – Cambridge Refugee Committee formed by Eva Hartree and others, to organise the first municipal reception for refugees fleeing from the rise of fascism across Europe – most notably from Germany and Spain. Those events above as standalone local events deserve some sort of centenary marking in their own right. As part of a story of our city – especially on civic and social progression, it feels far more powerful because all of these are ones that town, gown and village can celebrate together. We take it for granted that the wards of Trumpington, Cherry Hinton and Chesterton are part of Cambridge City as far as elections and public services go. 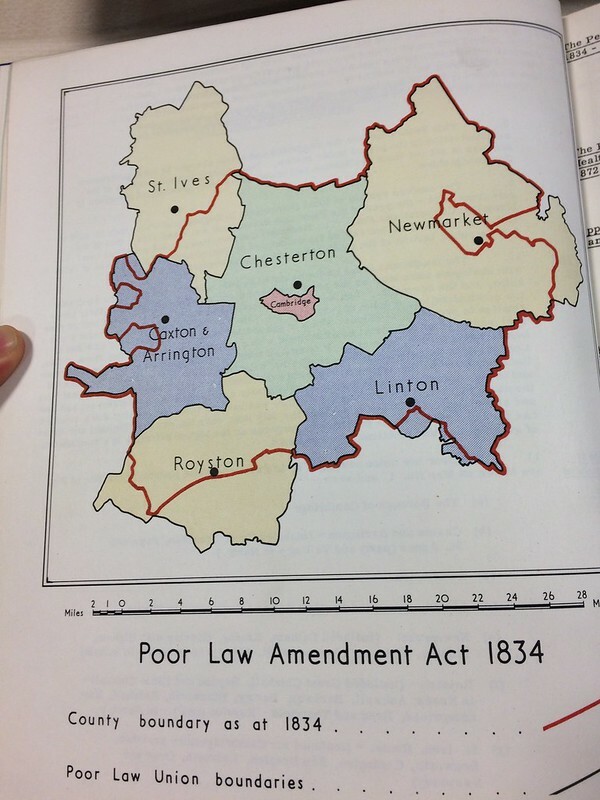 But all of these used to have their own councils – Chesterton once being its own rural district covering both these villages and much of what we now know as South Cambridgeshire. The civic boundaries of Cambridge used to be much, much smaller. But we grew. How will this influence the future of local public policy? One of the things I’ve felt for a long time is that we, the people of Cambridge do not have nearly as strong civic identity as we could have. Part of that is down to us not knowing our civic history as well as we could do. That in itself stems from the fact that the last person who wrote anything approaching a comprehensive history of Cambridge the town was Cambridge Labour activist, Professor Helen Cam CBE of Girton College, Cambridge. Cambridge Hero Professor Helen Cam – historian and benefactor of Romsey Labour Club in Cambridge. From Cambridge Women: 12 Portraits. In the case of this blogpost on the town’s history, I’ve already named figures from three Cambridge colleges – Newnham (Florence Ada Keynes, Eva Hartree), Trinity (Horace Darwin, Sedley Taylor) and Girton (Helen Cam). Wrote our civic history. Literally. No – really. Pages 1-149 of the official Victoria County History – Cambridge (the town) were written by Helen. I bought my own printed version of the history for £1 when the library was disposing of old past copies of the county history. Over the page all of the colleges are divvied up between various male historians (bar Girton (Jean Lindsay) and Newnham (Dorothy Brodie). Only Helen, supported by Susan Reynolds covered the town. The last update to this was in 1959. In a nutshell. That plus there was only so much Helen Cam and Susan Reynolds could squeeze into those 150 pages. There are other things that come up too that were contemporary for the time but for whatever reason have been forgotten. In part because so few comprehensive books on Cambridge’s history outside of Cambridge University and its colleges have been written and sold widely. I remain of the view that some of the academic theses I’ve read by local historians, academics and enthusiasts are good enough subject to topping, tailing and layout changes, for publication as books in their own right. Go into any bookshop in Cambridge however, and you’ll see just how few books there are on the story of our city. And even then, some of the more contemporary ones are dispassionate accounts of the rise of a specific industrial sector that follows the money rather than the people, written as publicity puff pieces rather than as histories with an honest critical eye. With history, what you choose to exclude is just as important as what you cover. Pretending that there are no negative consequences with some of the more recent developments is just as dishonest as pretending there were no good things that happened in developments in the 1960s & 1970s when we lost more than a few really nice buildings in the city. Because that’s the bit that’s been written about the least vis-a-vis the historical evidence that is out there. Rather than following the noise that is in the university guidebooks and photo-guides of college splendours with all of the oil paintings of old men on the gilded ancient halls, I’m following the silences and the absences. That plus the institutionalised sexism of the University of Cambridge and the churches linked to them is ever so striking. Florence Ada Keynes as Mayor of Cambridge was barred from having a full degree from Cambridge University due to her gender, despite being Mayor of Cambridge in 1932/33. Ditto Eva Hartree in 1924/25. And also ditto for another Newnham College student, Lady Alice Bragg who was Cambridge’s third woman mayor in 1946/47. Have a listen to her speech here from The Guildhall Balcony awarding the Freedom of the City to the Cambridgeshire Regiment, a number of whom had only recently been liberated from the hell of Imperial Japanese Prisoner of War camps in the Far East. (I covered the Cambridgeshire & the Fall of Singapore in 1942 in this post). Ultimately, it wasn’t until 1948 that Cambridge University finally removed the gender ban. Interested in finding out more on the social and civic history of Cambridge the town? The first place to look is the Museum of Cambridge. Florence Ada Keynes was one of the founding trustees of the Museum of Cambridge when it was founded as the Cambridge and County Folk Museum. They are on Facebook at https://www.facebook.com/museumofcambridge/ and on Twitter at @MuseumOfCamb. The museum has social drop ins every Friday afternoon from 2pm where a different subject is showcased or featured. If you are interested in getting involved – in particular on the history and actions of the women, drop an email to the museum. It really comes down to this: The more you know about a place and the greater the connection you have for a place, the more likely it is (I believe) that you’ll want to make difference to that place. Whether standing up against damaging developments or pushing for more positive things to be built or take place. It’s so easy to forget but it was a group of passionate teenagers and young adults in the mid-1980s who pushed for a new music and arts venue to be built in Cambridge. That is why Cambridge has The Junction.